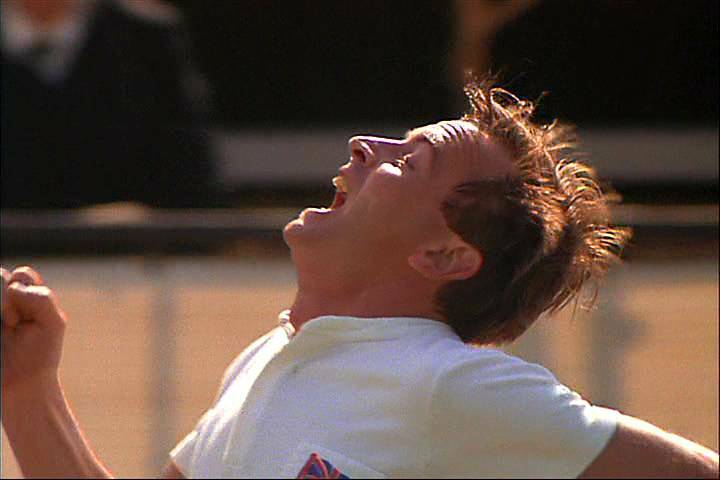 This is Eric Liddell – or an actor who played Eric Liddell in the movie “Chariots of Fire”. Eric Liddell (the real one) made headlines during the 1924 Paris Olympics when, after breezing through the heats, he refused to run in the 100 metre final because it was scheduled on a Sunday morning – the day and time when God’s people go to Church. So he went to Church on that Sunday, then later in the week ran as a last-minute entry in the 400 metres – which wasn’t his event – and promptly won the gold medal! This wasn’t the only thing that irked the Olympic gurus. Eric had this irritating habit of running “funny”. Contrary to all scientific sprinting theories of the times, Eric would run normally for a while, then begin lifting his knees high, throwing his head back and dropping his jaw, running like a crazy man. Then he would win. When questioned about his unorthodox style, Eric Liddell simply stated, “When I run, I feel God’s pleasure.” So it seems that this world-class sprinter, when doing what he was made to do, became supercharged by the joy of the Lord! The Church in our city can take a lesson from all this. These days, often the Church seems just plain tired. And it’s not the kind of tired that doing less fixes. In fact it seems that the less the Church does, the more fatigued it becomes. Perhaps this is because the Church needs to be doing more of what it was cut out to do. We need the joy of the Lord that comes from doing what we were made for, and the Spirit-stoked energy that proceeds from this. But, what are we made to do? What are we cut out for? Happily, the Word of God gives us some key insights into this question. These insights come in the form of the “identity” things that Jesus says about His Church. There are many times when the Lord helps the Church understand who we are. I’ll just mention three. First, we are ONE. This may be news to some of us in the Church as we continue to fragment, compartmentalize and isolate ourselves as households and local Church fellowships, but Jesus considers us to be one, a perspective which is summed up in His prayer to the Father as recorded in John 17:20b: “I pray also for those who will believe in me through their message, that all of them may be one…” So when we gather as the parts of the Body of Christ, cooperating to be His hands and feet in this world, we are doing what we were made for! Second, we are SALT. Jesus says, “You are the salt of earth. But if the salt loses its saltiness, how can it be made salty again?” (Matt. 5:13) According to Jesus, the Church is made to have a preservative influence on the world around us – preserving the truth that hope is still to be found in this world – hope in Jesus Christ. So it makes sense that we get out of the saltshaker and into the world, doing what we were made to do; preserving hope in Jesus in a world that has lost all hope, and bringing the flavour of Christ to a world that has become tasteless. So we are one, we are salt, and we are light. How can we as the Church do these things we were made to do, so that we can get out of the churchy doldrums and feel God’s pleasure as we function according to our design? I’m glad I asked. On Sunday, May 26th starting at noon at the new Bomber stadium, the Church in Winnipeg will be getting together to celebrate Jesus at the One Heart City Church service. It will be a great time, but more than that, it will be the Church being ONE, which is what we were designed to be. I know that we will feel God’s pleasure as we gather. The One Heart city-wide Church service is actually the kickoff event for another great opportunity to be what we were made to be. This opportunity is called Love Winnipeg – a chance for the Church in the city to be salt & light, working together as local fellowships in our city to preserve and shine, reflecting the character of God in our communities through neighbourhood cleanup projects, helping hands and practical expressions of God’s kindness to those around us. Here at WECC, we will be helping Discovery Children’s Centre on June 4th as we partner to provide a Family Fun Day for hundreds of people in our community. What an excellent chance to do what we were made to do, blessing and serving both this child care centre and the community around us! Of course, there will always be critics of the Church as we attempt to be what we were made to be – salt & light together in a world that desperately needs our help and our message. But, as with Eric Liddell, the criticisms lose ground to a victorious Church that, although at times running awkwardly, is feeling God’s pleasure.